As you branch out to pair your fugues with free works, the next thing you might try writing is a multi-sectional north German toccata in the style of Buxtehude, Bruhns, Lubeck, Boehm, or other old masters from the Baroque period, or even earlier. The north German organ repertoire from what might be called the "golden period" from Sweelinck to Bach can be compared to the ground zero for everything that came after it; it formed the foundation for everything else. The north German toccata, more commonly known as a "praeludium," is a free work composed in the so-called "stylus phantasticus," a multi-sectional composition which has alternating free improvisatory and fugal imitative sections, and its these alternations which provide the "flavor" for the whole piece. Such works typically have 7 separate sections: Free -- Strict (4/4) -- Free -- Strict (3/2) -- Free -- Strict (6/8) -- Free. This is the type of style that the young J.S. Bach undoubtedly studied when he visited Buxtehude at the age of 20 and imitated when he composed his "great" Toccata and Fugue in d minor, a form which all the north German organist/composers were using to improvise and compose at the time, only in Bach's work he condensed the generic 7 part form down to 3 -- a single large fugal section in 4/4 time framed on each side by a very free introduction and close [See blog, Bach d minor, Parts I-V]. This entire work may very well have arisen from an improvisation that Bach developed on the spot from an early sketch, one which he later committed to paper for its practical use with the possible assistance of a copyist who attached to it the title "Toccata con Fuga." This is sheer speculation, but, since the autograph of this piece is missing, the general consensus of opinion favors the idea that Bach, if he gave the work a title at all, would have called it a "Praeludium." Technically, the term "Praeludium" takes in the entire multi-sectional form, main fugue and all, as Bach reworked it, but later editors grouped the central imitative section and the free close together as the "Fugue," leaving the free introduction all by itself as the "Toccata." The title "Praeludium and Fugue" therefore is a bit redundant. The writing of the free sections will test our imagination a bit as well, perhaps a bit more than the writing of the fugal imitative sections, which we might consider doing first and then connect them together by means of the free sections [See blog, Ten Steps]. The thematic material used in the free figuration passages and the short fugal imitative sections does not have to derive from the notes of the main fugue subject, but, when it does, it lends a definite unity to the entire work and gives the writer a good bouncing-off point ... something around which the free figuration passages might be spun. Which is another reason why it's helpful to compose the fugue first, as we might then vary the notes of its theme by rhythmic transformation (same notes in sequence but different note values) to come up with further ideas for the various sections which precede it. This entire very spacious work develops from one simple 9-note figure which is based upon the first 6 notes of the d minor scale, thus providing a very strong unity. 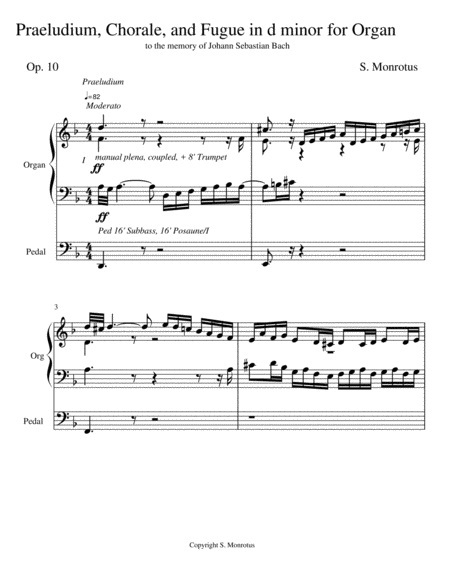 The 1st free section of the Praeludium employs running scalar passages, arpeggios, detached ornamented chords, and a virtuoso Pedal solo; this section closes with a full cadence in the home key. Certain notes in this Praeludium were ornamented, either with a trill or lower mordent; these ornaments were written into the notation of this score to facilitate the intended execution. The 1st strict (4/4) section follows; its ornamented subject begins in the alto on scale degree 5, and thus is provided with a (real) answer in the subdominant; this section also closes with a full cadence in the home key. The following free section converts to 3/2 time and presents a trio texture during which the hands play rapid figuration in 2 parts. For this passage an 8-foot Principal is called for in the right hand which supplies the soprano/alto part, a 16-foot reed in the left hand which provides a very animated bass, and an 8-foot Principal in the Pedal which provides the tenor line. Here all one has to do to provide the proper Pedal stop is retire the 16-foot Pedal stops, as the 8-foot Principal is already drawn. During this trio the tenor line in the Pedal is never permitted to cross the parts for the two hands. This section remains in the home key and closes with a half cadence (on the dominant chord). The 2nd strict (3/2) section which follows returns to the opening registration and presents yet another ornamented subject; it begins on scale degree 1 and is provided with a real answer in the dominant. This section closes on a dissonant dominant chord held over a tonic pedal note which squirms a moment before it resolves finally (to the tonic chord of d minor). Bach showed us in the opening fanfare of his "great" Toccata and Fugue in d minor that when we sit on a dissonant chord over a tonic pedal point like this for a brief moment, let it squirm, then do the resolution, it's good for the listener to hear this tension, then the release. It will be noted that Bach's melodic signature of 4 notes (Bb-A-D-B in the German language) has been written into the counterpoint in this section, in the alto voice, to pay homage to the dedicatee. The 3rd free section which follows consists of repetitive figuration for both hands over a tonic pedal point on middle D of the pedalboard preceded by a longer dominant pedal point on low A; a soft 16-foot covered flute stop is called for in the Pedal so the other 2 moving lines can be heard more clearly above it. This section is a variation in which the 9 note figure dissolves into figuration to where nothing remains of it except the harmony; it also closes with a full cadence in the home key. The theme for the 3rd strict section converts to compound duple (6/8) meter; here there is a return to the opening registration; the subject enters in the tenor on the 1st scale degree and is provided with a real answer in the dominant. The free close, in this work, is a continuation of this final strict section, in the same meter and tempo, and finishes in 6 voices using an extended plagal cadence and a Picardy third (major 3rd interval in the final chord of a work in a minor key). It will be noted that in each of the strict sections the 1st entry is in a different voice each time, but the 3rd entry is always in the bass. The central movement called "Chorale" and the Fugue which follows are described separately in different postings [See blog, Getting Started With Writing, Parts III, V]. It helps, when writing a piece like this, to keep our expectations realistic and know that we're going to grow steadily as a creator of music as we wade into it. We should start small and work in little bits, a small step at a time; it isn't the 60 yard dash; it's a marathon. All knowledge, education, and skill is a progressive science where there's no such thing as instant results. Bach himself didn't start composing until he was in his very early teens and, at that, only after he worked at things, a little at a time, in successive stages. No one starts their formal education by going to high school; they start in kindergarten and first grade. No one climbs a ladder by putting their foot on the first rung and then the other foot on a rung 2/3 of the way up. It helps immensely to refrain from cross comparing our own level of skills to some famous person like Bach or someone else around us, like a beloved teacher who seems to play everything as if no difficulties ever existed for them; this is an illusion; in the beginning, they encountered many difficulties, same as us. It's always best to concentrate on our own things and our own level of skills, and just give ourselves room to grow at our own [See blog, Cross Comparing]. When we do this, we find ourselves making good, steady progress as a performer, an improvisor, and yes, even a writer of good organ music.